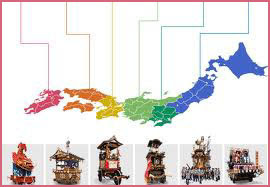 A prefecture of Japan, which forms part of the Kansai region on Honshu Island. The capital is the city of Otsu.
. Shiga - Entries of this BLOG . Mishiho ritual at temple Enryaku-Ji .
. Karasaki matsuri 唐崎祭（からさきまつり）Karasaki festival .
. Sagichoo matsuri 左義長まつり　Sagicho festival . Annual festival at the shrine Hirano Jinja in Matsumoto ward, Otsu town. It used to be held on the first day of the fifth month. 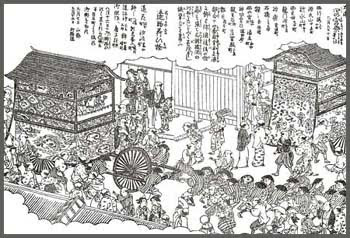 This festival has a long tradtion, when Otsu was prosperous along the trading routes leaving Kyoto.
. Otsu Paintings (大津絵) . A famous place for cherry blossoms, which are illuminated in the evenings. The Hirano Shrine (平野神社) is a Shinto shrine in the city of Kyoto. 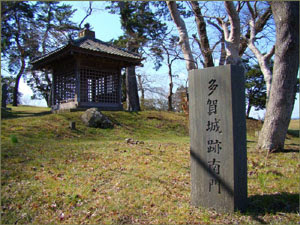 This shrine is known and popular for its gardens and many trees. 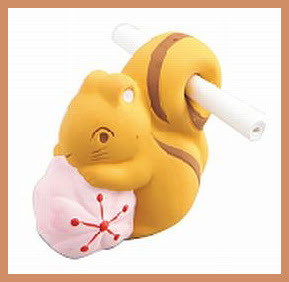 The squirrel is the messenger of the deity of this shrine and delivers the mikuji sacred lots 御籤. 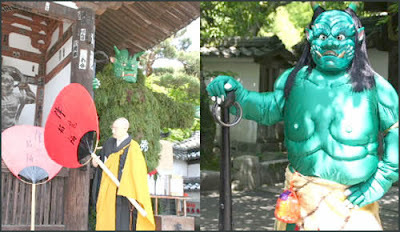 Two deities are enshrined at Taga Taisha - Izanagi no-Okami (father of Amaterasu-Omikami enshrined in Ise Jingu) and Izanami no-Okami. It is popular among many believers as a shrine of life prolongation and longevity while also protecting people against evils. 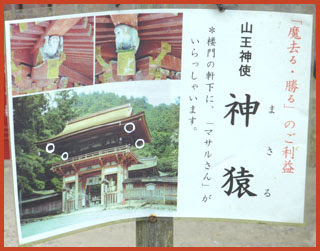 The shrine has a long history indeed as it even appeared on "Kojiki", the oldest record of events in the country completed in 712. 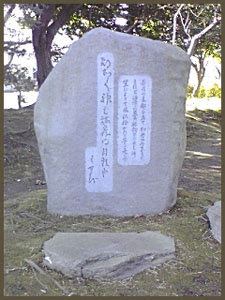 On its grounds is a rock called the Chojuseki that is believed to be effective at life prolongation. Additionally, the Otaga-Jakushi, a charm to protect you from sickness and grant you longevity, is sold for 300 yen a piece which is indeed popular among many. 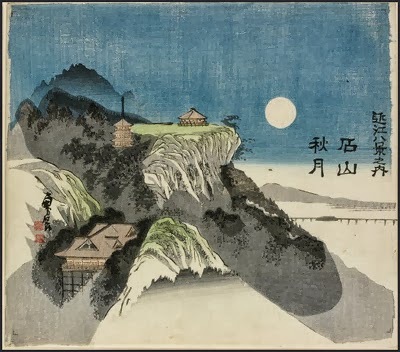 The Okushoin Teien (place of scenic beauty) is a unique type of garden that can be seen by looking down from the Shoin. Actualizing a wonderful harmony with the Okushoin, the two features indeed create a beautiful landscape. 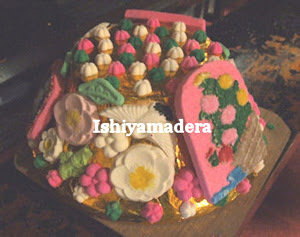 The Itokiri-mochi sold at "Tagaya" in front of the shrine is a famous confection that is elegantly sweet. It is made by stretching a soft lump of rice cake with a filling into a thin strip and cutting it into several pieces with a string. A talisman shakushi (Japanese ladle) from the reign of Empress Genshō. Allegedly the origin of the Japanese word otamajakushi. A festival of planting rice with traditional rites. 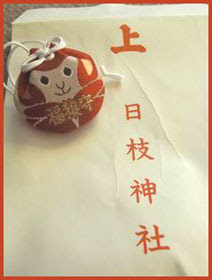 Lantern festival held on the night of August 3-5. Tagajo 多賀城　Tagajo Castle in Miyagi pref. Tagajō (多賀城市, Tagajō-shi) is a city located in Miyagi Prefecture, Japan. The city was named after Taga Castle, the capital of Mutsu Province. As of 2010, the city has an estimated population of 63,256 and the population density of 3,220 persons per km². The total area is 19.64 km². The present day city was founded on November 1, 1971. The tsunami in 869 caused extensive flooding of the Sendai plain, destroying the town of Tagajō. Archaeological investigations have identified the remains of 8th and 9th century buildings beneath the present town, covered by sediments dated to the middle of the 10th century. The town was again seriously affected by the tsunami caused by the 2011 Tōhoku earthquake. As of 7 April 2011, 177 people were known dead, with 15 missing. 1,811 people were living in shelters. There is also a great tea ceremony. 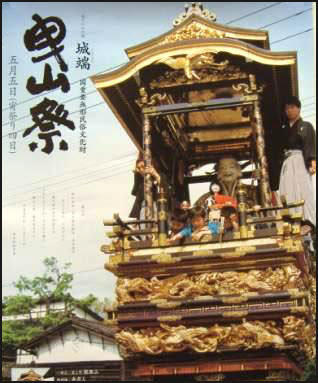 Hikiyama are large and high floats, that are pulled (hiki) around town. 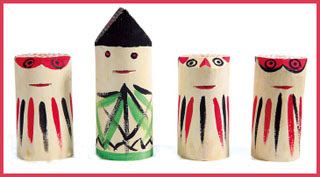 They can be more than two stories high, including a band, dancers, dolls or other decoration or entertainment. 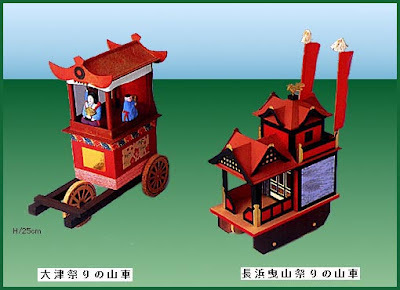 A regional list with all festivals.
. Danjiri Festival Float 山車 . 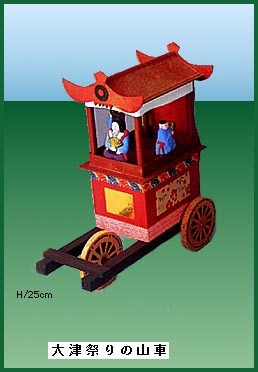 長浜曳山祭りの山車 float of the Nagahama festival .
. Folk Toys from Japan .
. WKD : hikiyama .
. WKD : danjiri .
. danjiri 山車（だんじり）festival float . One such theme is the Tsukuma Matsuri. 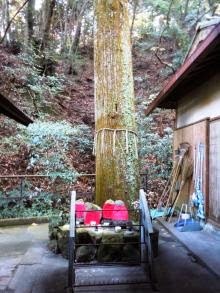 Held at a Shrine in what is now called Maihara Town, Sakata County, Shiga Prefecture, this pot-wearing festival is considered one of the three most famous odd festivals (chinsai). Even for the old Tsukuma Festival! Read the full story HERE ! A common iron pot, to be hung over an open hearth (irori) in the old kitchen. More photos are here and when clicking on the thumbnails!
. 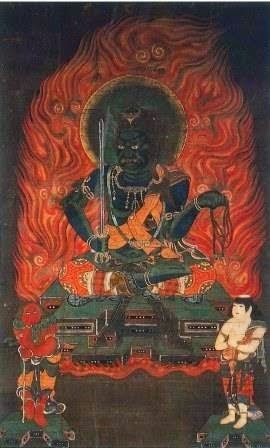 . . A story from early thirteenth century Japan tells of a medicinal hot springs in a town called Tsukuma, in old Shinano Province (modern Nagano Prefecture), where a townsman had a dream in which a voice announced that Kannon would come to the town square the next day. The dreamer asked how he would know it was Kannon, and the voice described a scruffy, thirtyish warrior on horseback. After the townsman awoke and told his friends, everyone in the village was excited and gathered at the appointed time. When a samurai fitting the description arrived, everyone prostrated themselves to him. The astounded warrior demanded an explanation, but the townspeople just continued their prostrations until a priest finally told him about the dream. The samurai explained that he had fallen off his horse and injured himself, and simply had come to the medicinal springs for healing. But the townspeople continued making prostrations to him. After a while it finally occurred to the perplexed warrior that perhaps he actually was Kannon, and that he should become a monk. He discarded his weapons and was ordained, later becoming a disciple of a famous priest. This former warrior is not otherwise noted in history. 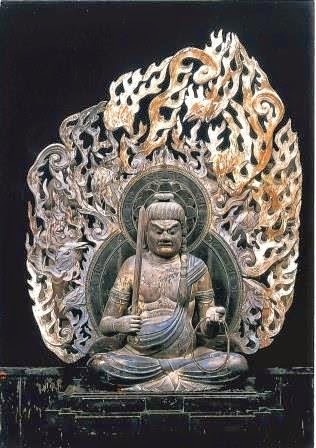 Just to become an ordinary monk was enough to allow him to consider himself as Kannon. The womenfolk had to wear one pot for each man they had intimat contact with.